Today Hasbro shared details on a number of new products featuring everyone’s favorite symbiote – Venom! Hasbro revealed the first two figures, Venom and Carnage, from a Venom-themed wave. The build-a-Figure and other characters planned for this wave are unknown. 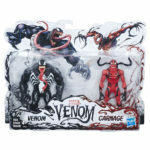 Also revealed today were Titan Hero versions of Venom and Carnage and 6″ 2-pack (think the Black Panther “kid” figures on shelves now) of Venom and Carnage. All these products will be on store shelves this fall. Complete details and pictures are below. figure features several points of articulation and comic-based design. Includes two figures. sold separately. Available at most major retailers and on HasbroToyShop.com.